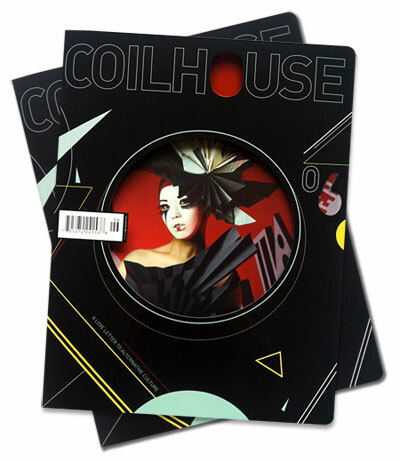 Coilhouse » Blog Archive » Got Your Copy of Coilhouse? Three Important Notes! Got Your Copy of Coilhouse? Three Important Notes! Guys, thank you so much to all of you who have ordered Coilhouse Issue 06 in the past day. It has been an emotional day for us, watching this issue sail out into the world. It’s been great to watch the list of orders and recognize the names of friends and long-time readers. You guys are awesome. 1) Make sure the shipping name and address is valid and dependable and let us know immediately if it needs to be corrected. 2) Kindly keep in mind – due to high volume orders, delivery time can be 1-3 weeks (or up to 4 weeks for international) from date of purchase so there may be a delay. We normally get them out much faster, but during that first wave of sales, things can get a little backed-up. If you do not receive your order within the aforementioned time slot for your location, PLEASE contact us with your PayPal confirmation email right away. We’ll sort you out! Annnnnd – to everyone who purchased a Molly Crabapple print – those were shipped today. If you’re international, it should arrive with 5 days or so… in the U.S. around 3 days. Yay! Thanks, Mishy! You rock! All you beautiful, wonderful, amazing folks who ordered the combo, please bear in mind that the print and the magazine are being shipped from different parts of the world, and may arrive on different days. Worry not! It’s better with you don’t give us fake dates even if you didn’t mean them to be fake, it only makes me apprehensive about something I was super patient about. Hi guys, I apologize. It know it’s frustrating to think you’re getting an automatic email, and having it come late. It’s been my responsibility to get this part working, and it’s just turned out much harder than I expected. I projected the dates incorrectly, and I apologize. I am working on it now, and will post an update when it’s done! Thanks so much for your patience, and sorry again to keep you guys waiting! That project took so much longer than expected! Turns out that BigCartel and custom PayPal IPN scripts definitely don’t play well together. Guys, let me know if you all received your notifications. If not, I will send one to you immediately. Thanks again for bearing with this! Mine is here! It even withstood the postman’s attempts to fold (or wad) it up. I swear, he was glaring at me while he tried and failed. I’ve gotten every issue from 2-5 at my local B&N, and when this issue was released I called them about it. Their magazine person told me “That’s a quarterly (lol) and we don’t carry it anymore.” So I ordered issue 6 online not wanting to miss out entirely. Thanks I got it now :) very excited about the origami pattern, have been busy folding it! I like how even though it doesn’t really have any complex folds (just valley and mountain) it’s a complex pattern anyway, I will have lots of fun with this one! oh em gee ladies. oh em gee. this is the best of the best, been reading you since coilhouse 1 and i devoured this one front to back and could not wait to return to it when i had to put it down. reminds me of those perfect albums, say the pixies ‘doolittle’ for instance, you can put them on and play them over and over and they are just perfect from start to finish. no filler, no fluff, just inspiration. one of the best love letters ever written. thank you for your exemplary work. So happy you think so, Jesse! We all lived with this issue for so long (a YEAR?! ), and that time period was so fraught with frustration and grief that I think we’ve all long since lost perspective on it. It is a relief to hear that you think so highly of it! Hooray! Thank you.